Having missed travelling on Britain's shortest branch line back in January and March due to the People Mover not being ready, I finally made it today. I arrived at Stourbridge junction from Birmingham Moor Street expecting to see it waiting in the station if my timetable was correct, but the platform was empty. When I got over to platform 1 the next train was due to depart at 13.24, so obviously the timetable I had was wrong. Standing at the end of platform 2 I saw it coming up the hill and got a shot of it. Once on the platform it soon filled up and I was lucky to get one of the last seats. Some single seats face the direction the "train" was going in, down to Stourbridge Town, whilst the rest were sideways facing like on the underground. We had a lady driver who kindly let some of the late stragglers sit in the cab seats. My first impression was there weren't enough seats and and it was more like a bus inside than a train, and why on earth did London Midland or whoever decide to change from a seventy seat bubblecar to a twenty seat People Mover? Anyway we set off on time and straight away the male guard came and checked our tickets. 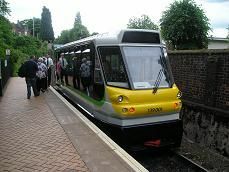 The line to Stourbridge Town is separate from the Birmingham line so we go left of the signal box and start descending straight away, curving to the left. I notice how bumpy it is and think how lucky I am to have a seat. As we go into a cutting with trees on either side we speed up to about 30 mph. Then the line ahead straightens up, as we pass under two bridges and the station comes into sight ahead. People start getting up before it stops and there's a queue of about ten people all waiting in line to get on. The People Mover soon empties and then fills up with the new passengers. this time there's room for everyone to sit down. The station is quite small and has just a single platform with a red brick station building. I have a quick chat with guard who explains that the timetable in the London Midland booklet is due to start on Monday after a period of "settling in". He also gave me a leaflet about the changeover. It explained why they have gone for a much smaller rail vehicle - because they expect 50-60 people to stand on such a short journey and the bumpiness is caused by the old Class 150 units mis-aligning the track and once the maintenance people mend it, the problem should stop. The return journey is of course up hill and so takes a minute longer, but I did find a journey on Britain's shortest branch line was quite enjoyable and almost quaint.